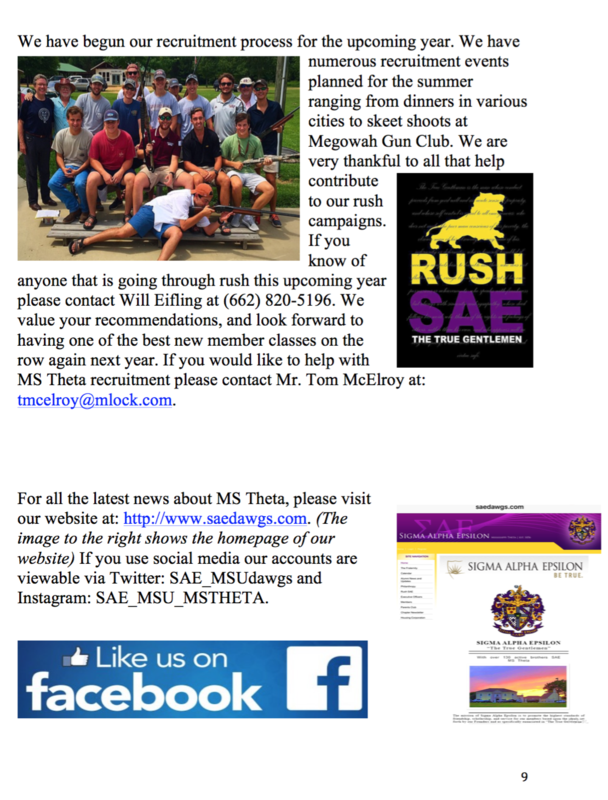 As another semester opens, we at Mississippi Theta wanted to give you a Chapter update. We had a good recruitment class this year. 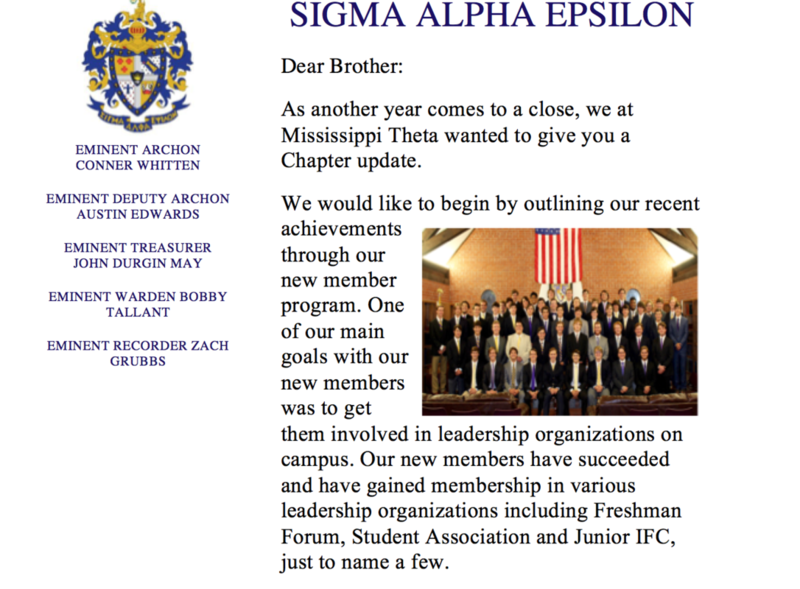 We initiated 42 new members last fall and 6 more this spring, giving us one of the largest Sigma Alpha Epsilon new member programs in the nation. 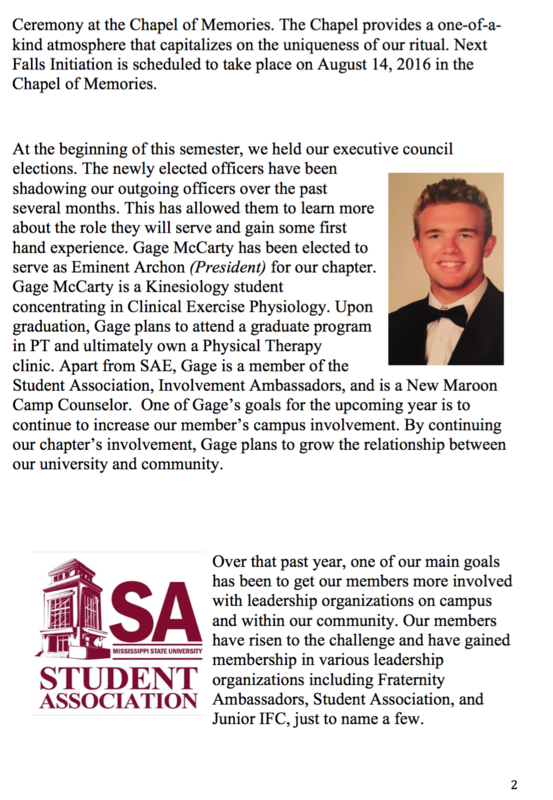 We also have the largest number of members seeking campus-wide leadership offices this Spring. 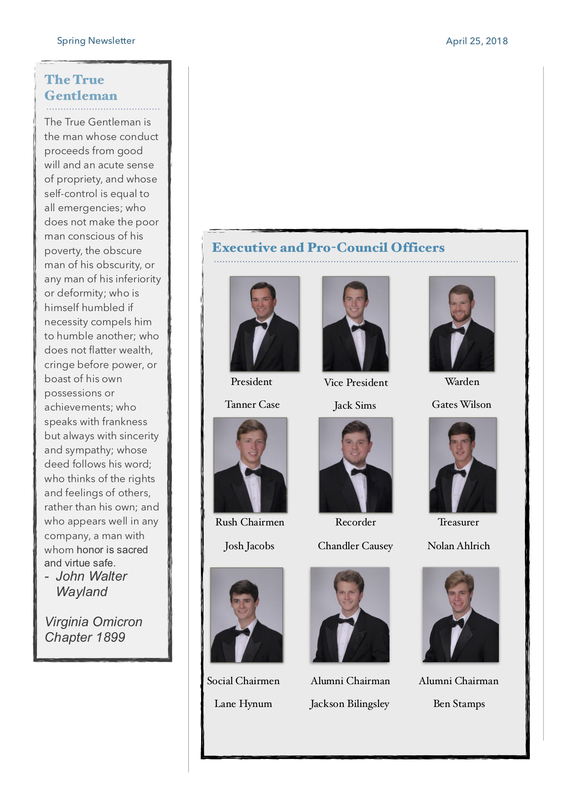 With your help, we can continue to recruit quality young men. 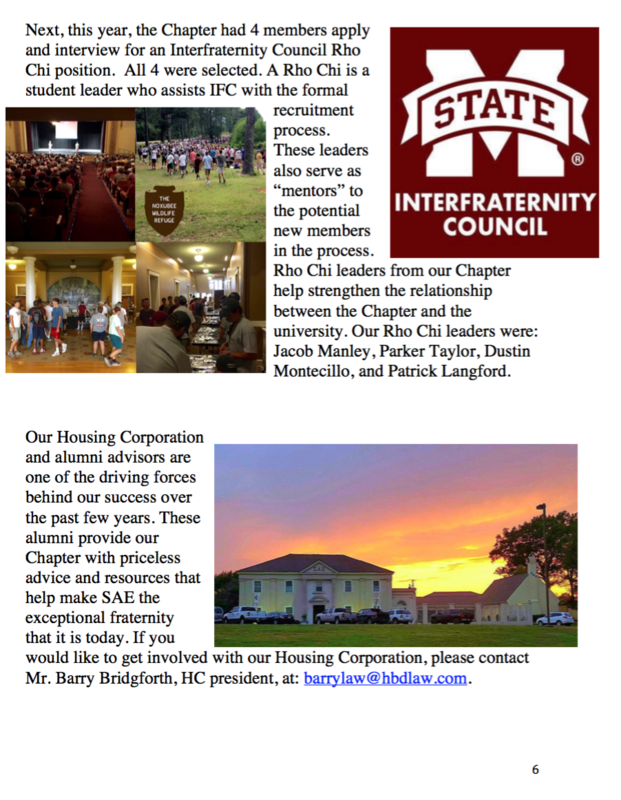 If you know of anyone coming to Mississippi State who would be a good fit for our chapter, please contact Drew Ellis (731-267-2434, de313@msstate.edu). 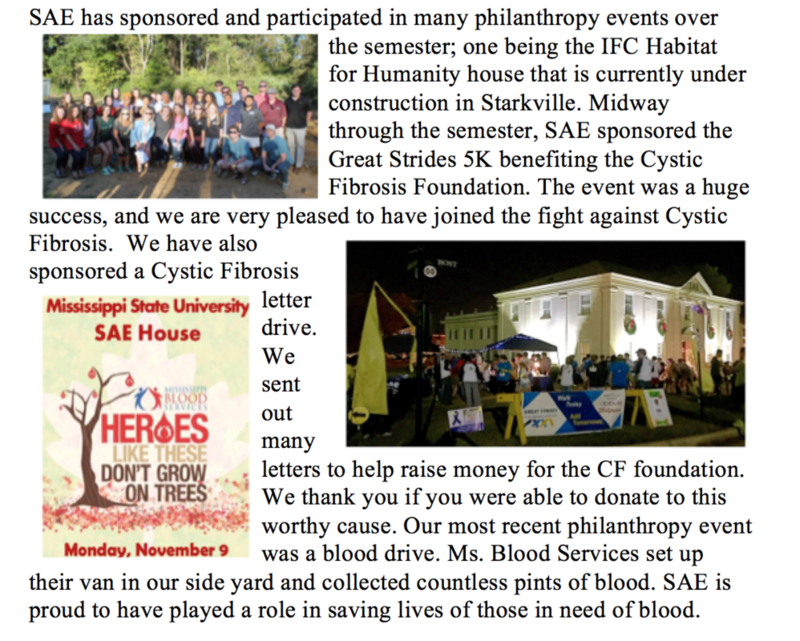 Last fall, we held our annual donation campaign for the Mississippi Chapter of the Cystic Fibrosis Foundation. We exceeded our goal of $6,000 and were able to collect $8,567. 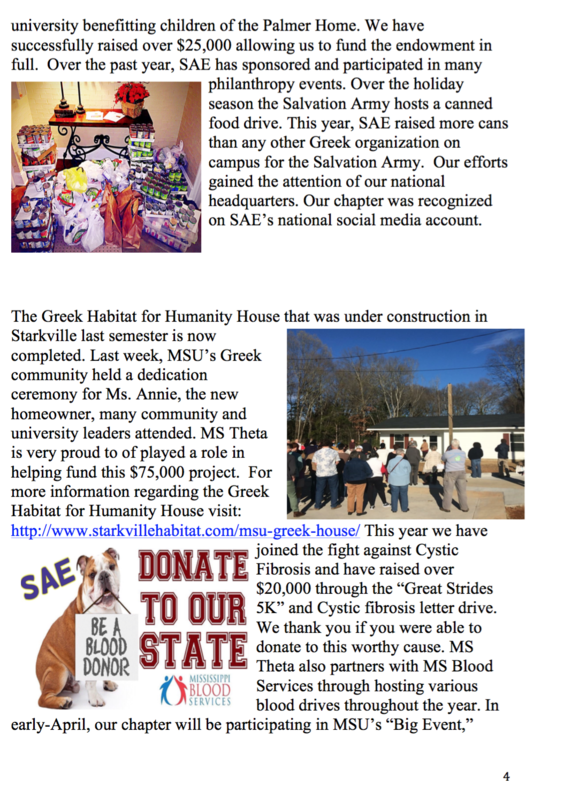 Additionally, we held the fall installment of our biannual blood drive through Mississippi Blood Services. 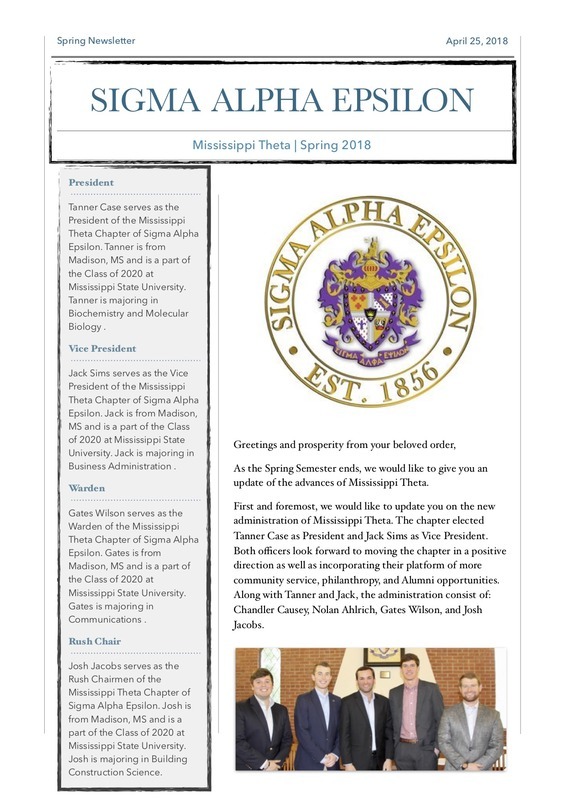 Between last spring’s and last fall’s blood drive, we collected enough blood to be named the 2014 Fraternity of the Year by Mississippi Blood Services. 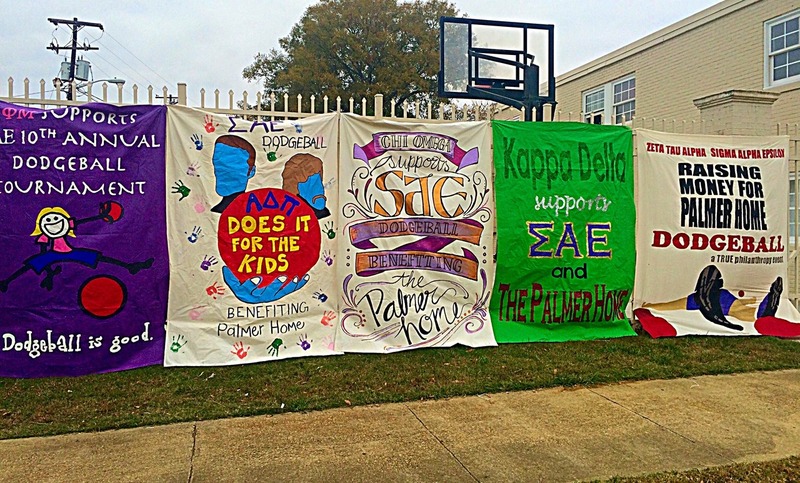 Furthermore, we held our 10th annual Paddy Murphy Dodgeball Tournament for the Palmer Home for Children. The Pi Beta Phi team took home first place in the women’s division, while our team swept away the competition in the men’s bracket. This year, we had a Cheese Fry Late Night at the house as part of the tournament. We served over 700 people. 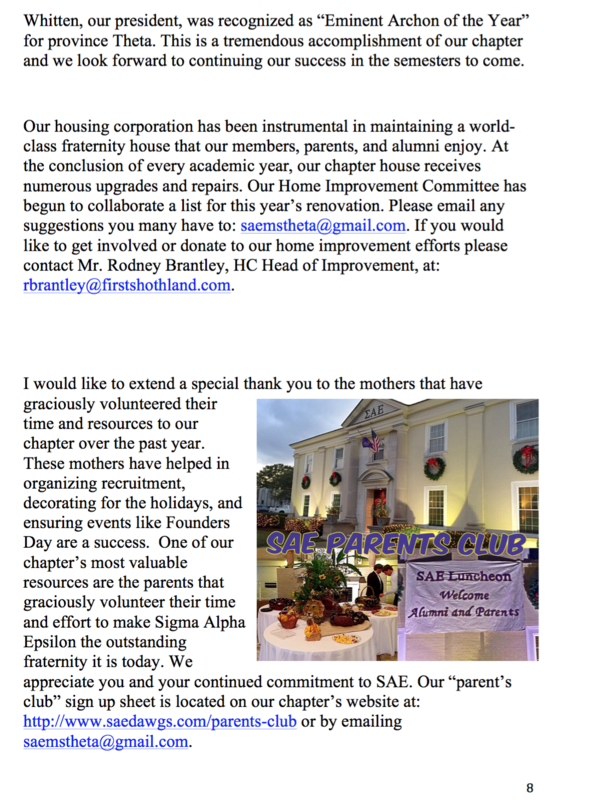 We also changed the format of our annual donation to the Palmer Home. 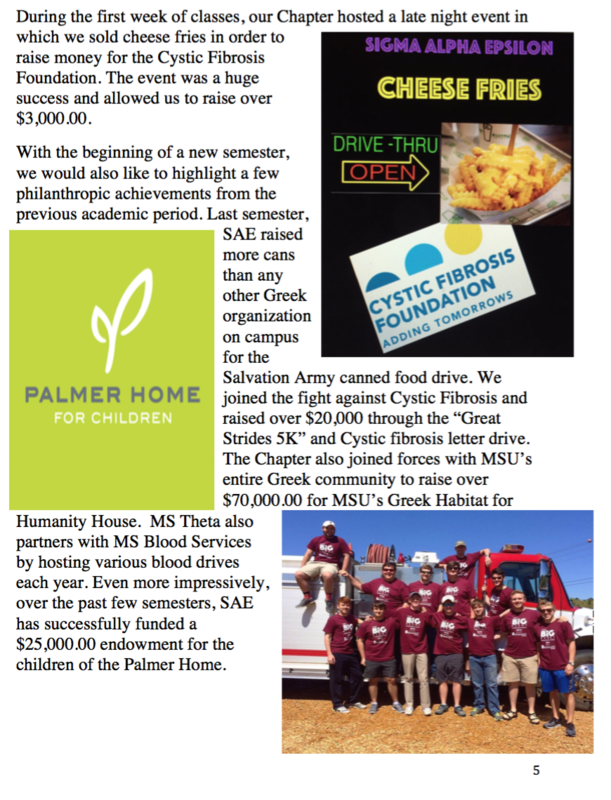 Instead of simply donating the money we raised, we created an endowment fund through the University to fund the education of the children at the Palmer Home. At the end of the week, we raised $30,336.28 for the Palmer Home. 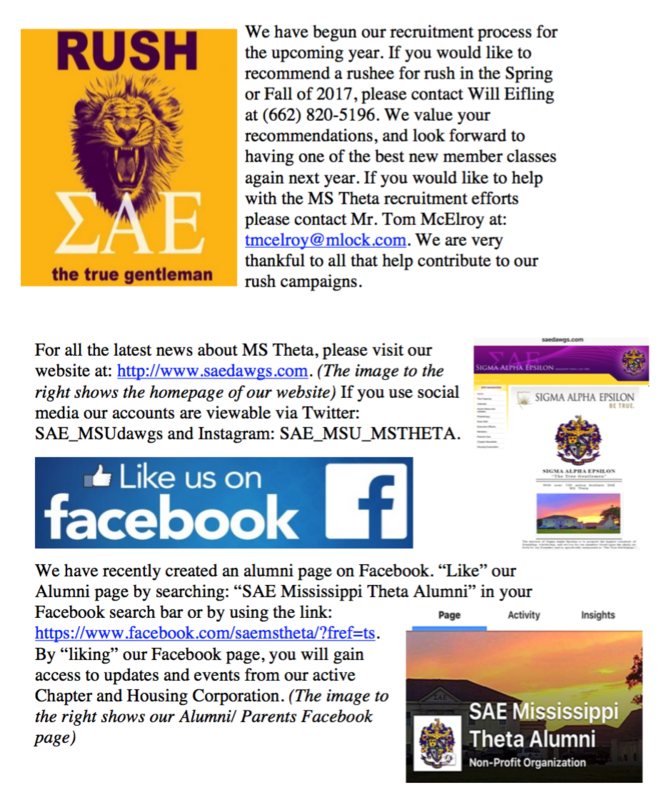 If you would like to make a donation to the endowment fund, you can contact Patrick Smith (601-709-9615, pcs113@msstate.edu). 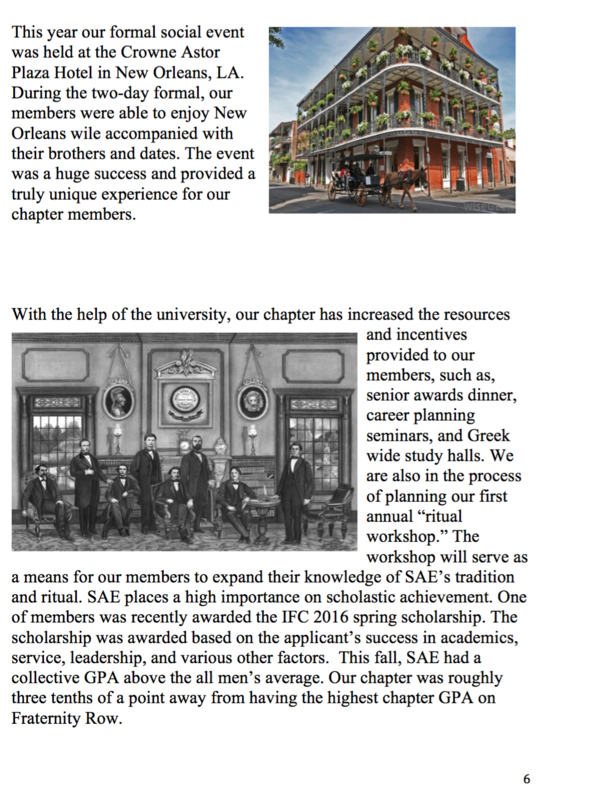 Finally, the Chapter and the House Corporation will be hosting a Founder’s Day Banquet at the house on Saturday, March 21 to celebrate the 159th Anniversary of our great fraternity. You will be receiving a separate invitation for the event. 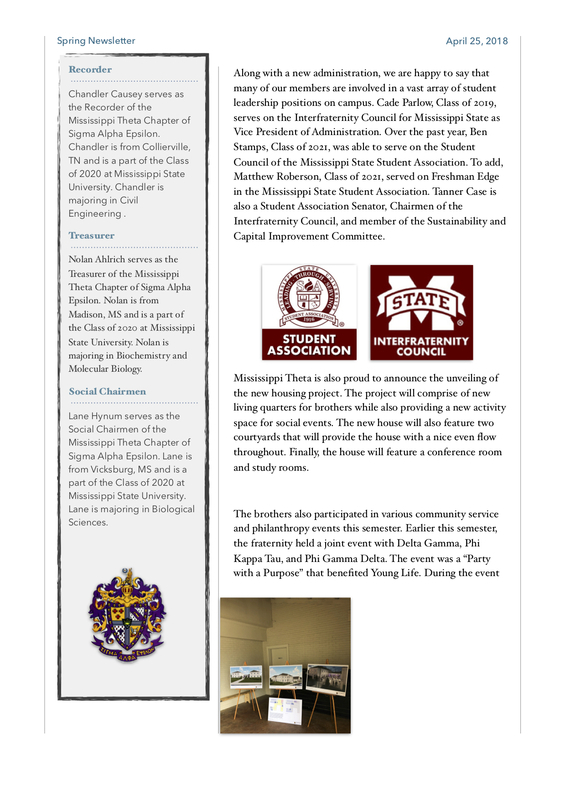 We hope to see you at the Founder's Day Celebration or during your next visit to MSU. 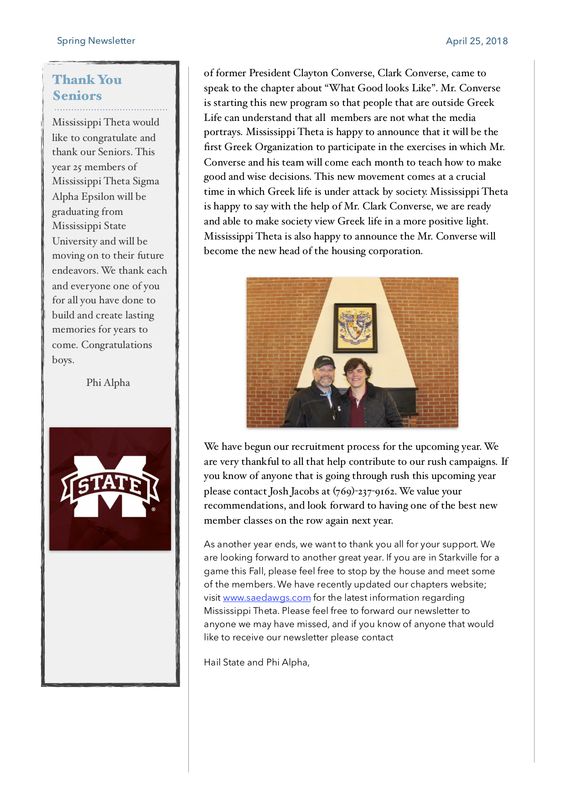 As another year begins, we at Mississippi Theta wanted to give you a Chapter update. 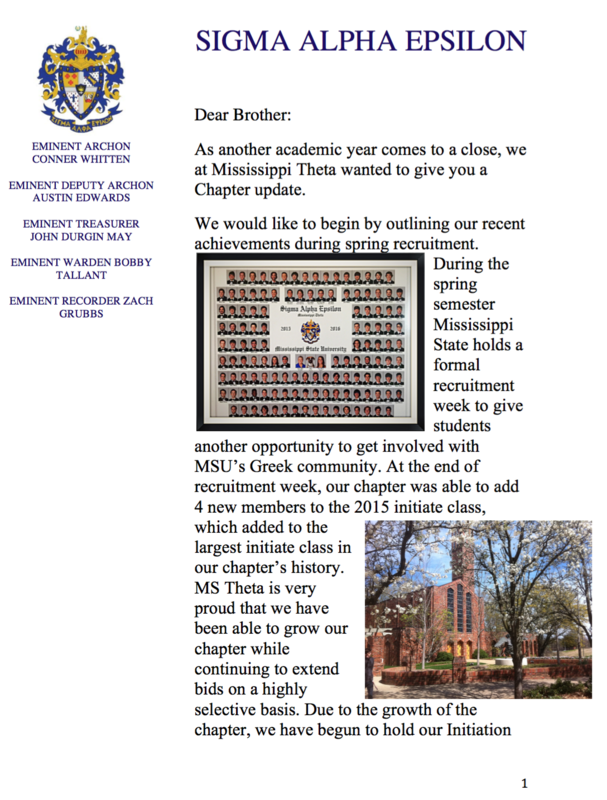 We would like to begin by talking about our recent achievements through rush. 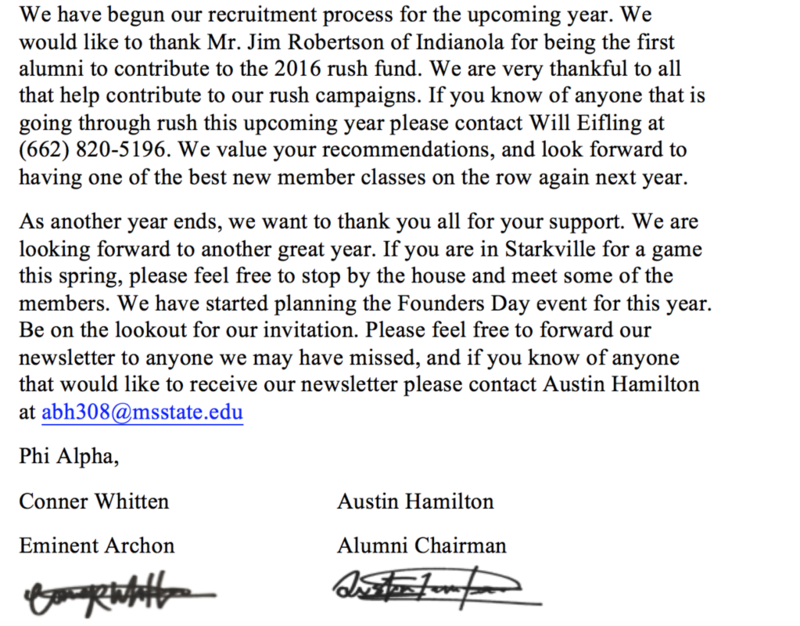 This year we continued to achieve one of the best new member classes on fraternity row. 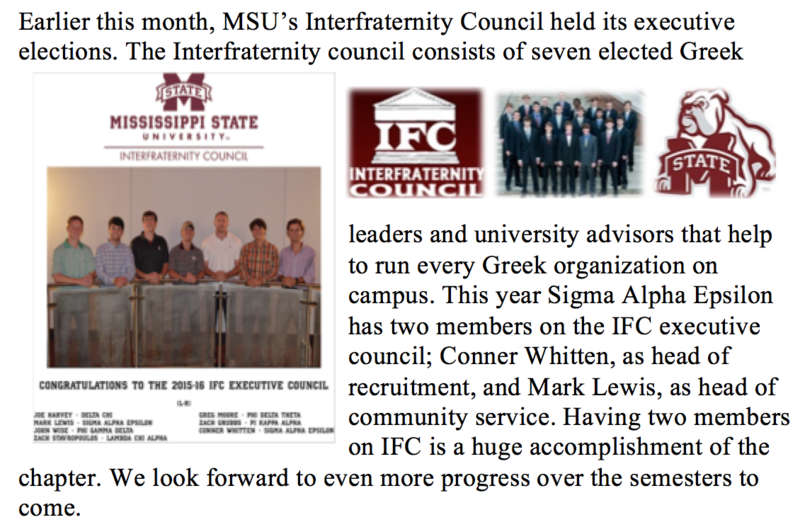 We signed over fifty new members through formal and summer recruitment. 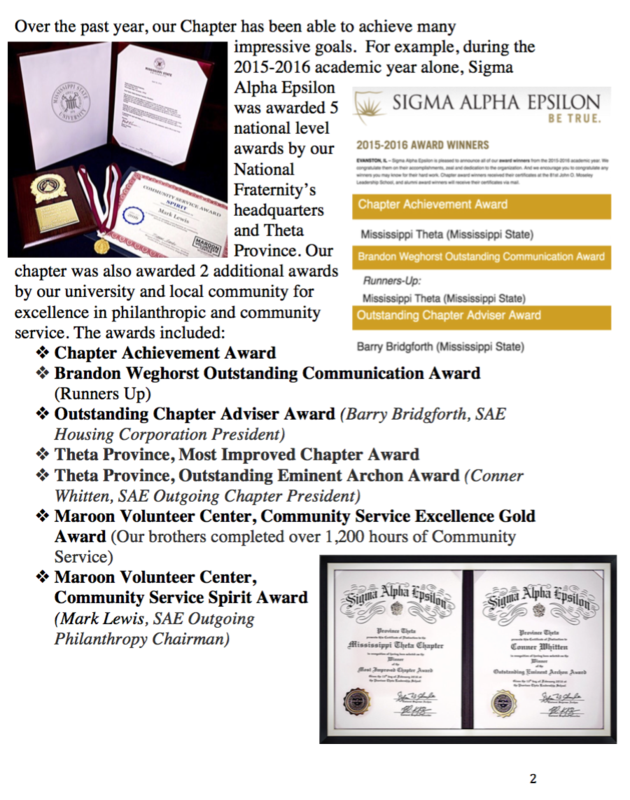 Our chapter was recognized on a national level from our previous ESA, brother Brad Cohen. Thank you to all that helped during the rush season. 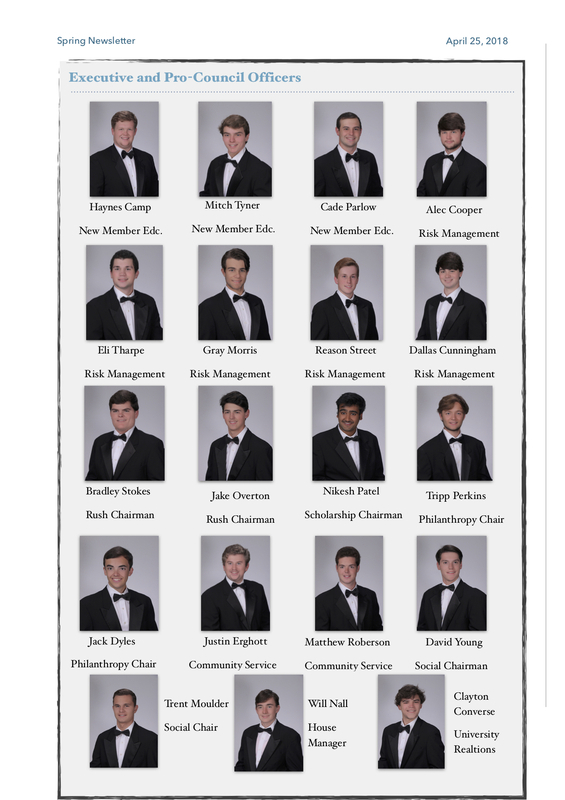 If you know of anyone that is going through rush this upcoming year please contact Will Eifling at (662) 820-5196. 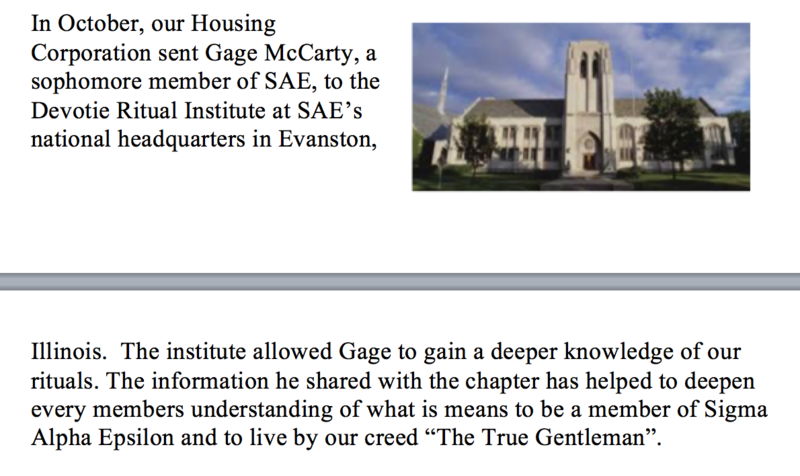 This summer the chapter house received over $65,000 in renovations from our Housing Corporation. The house received all new tiles in the rooms and new showers. We also were able to add new exterior lighting to the front of the house. Thank you to all that have helped to keep our house in good condition. 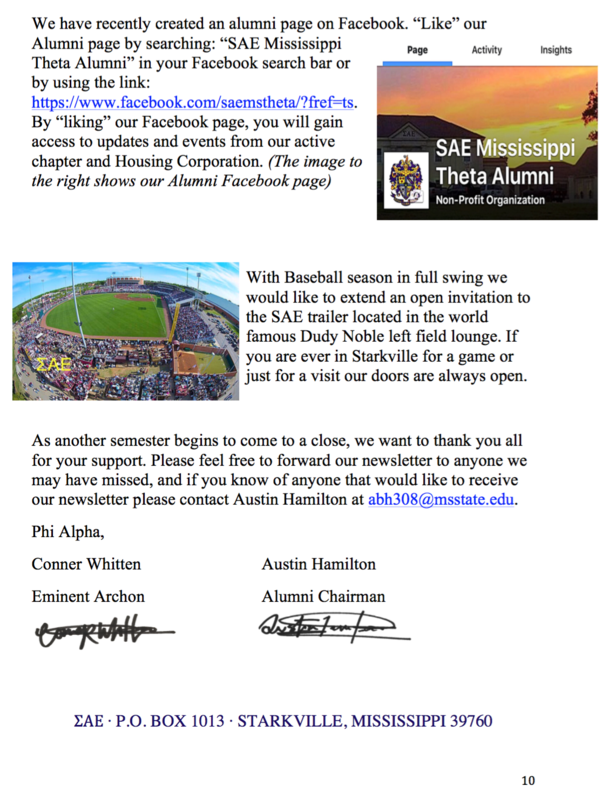 Please contact Rodney Brantley at (662) 571-5869 If you would like to know more about the renovations. 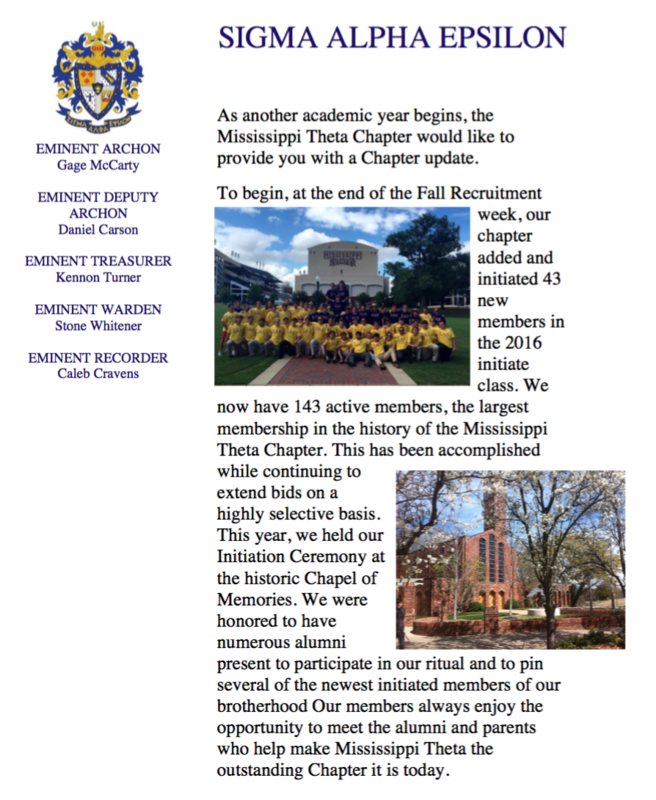 We recently finished the restorations of the chapter room. We were able to refinish all the wood furnishings and add new seating for members during chapter meeting. 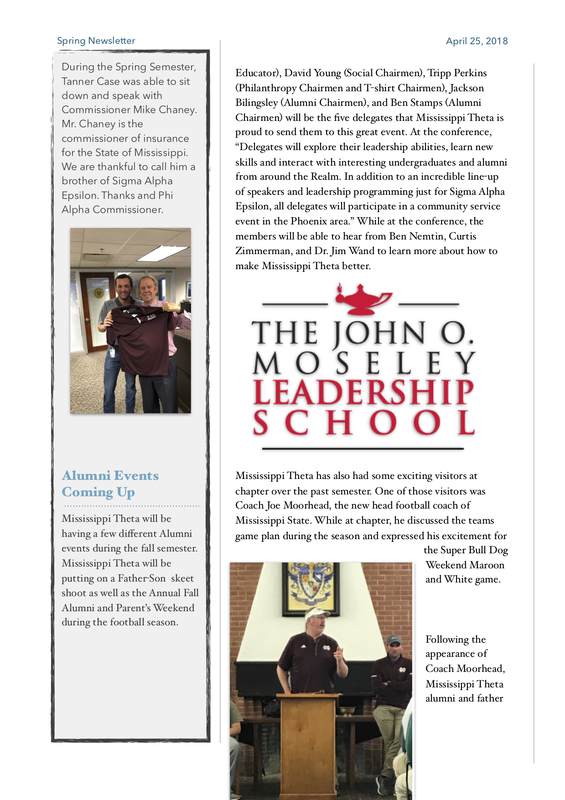 This summer our Housing Corporation was able to send two members to the John O. Mosley 80th annual leadership school. 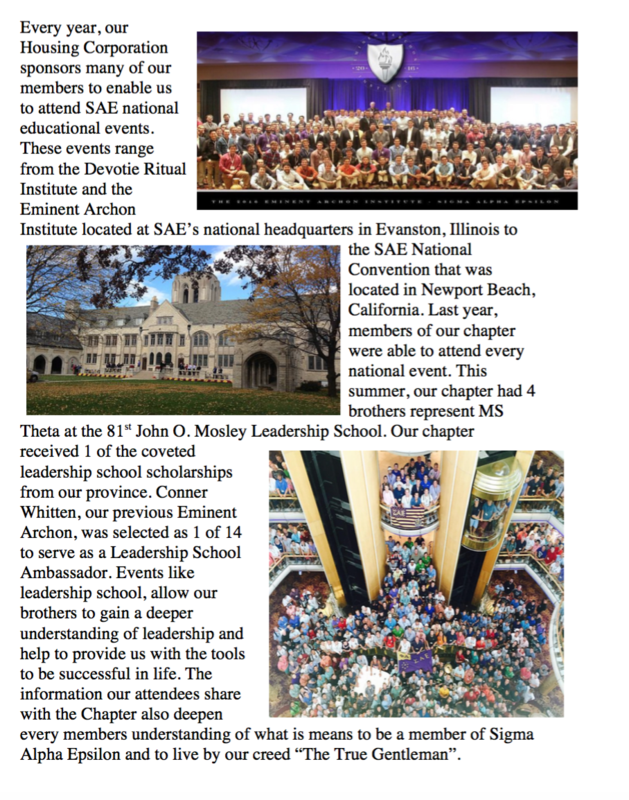 The school allowed for members to gain valuable leadership skills that will be brought back to the chapter in the upcoming weeks. 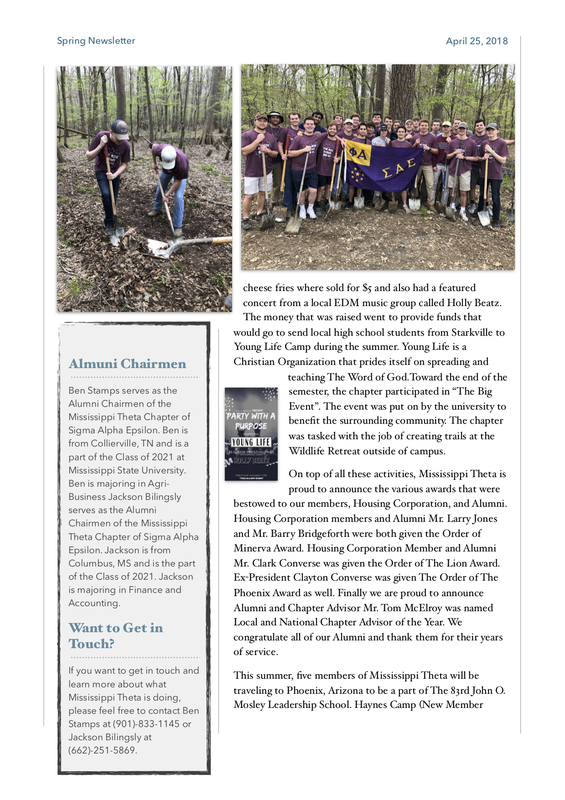 As another year winds down, we at Mississippi Theta wanted to give you a Chapter update. 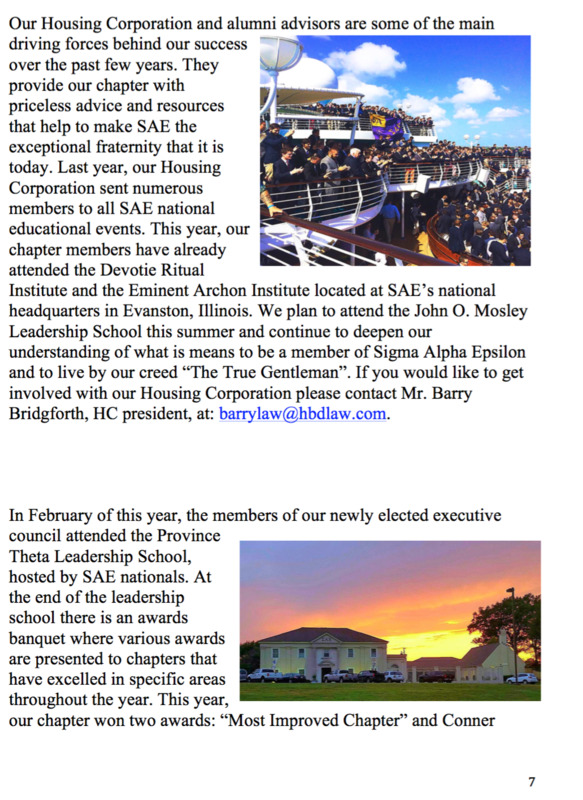 This past March, we held a Founder’s Day Banquet at the house to celebrate the 159th Anniversary of our fraternity. 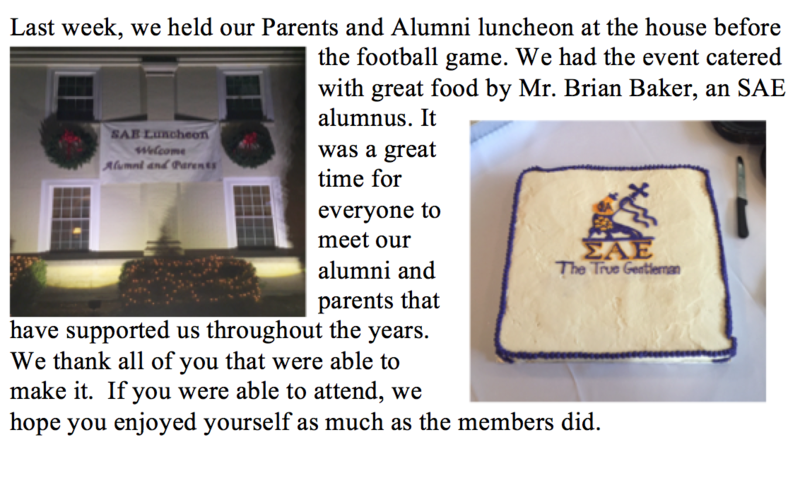 We had a good turnout; over 70 alumni and 40 active members attended. We would like to thank all of those who helped make this event a reality and everyone who came out and supported our chapter. 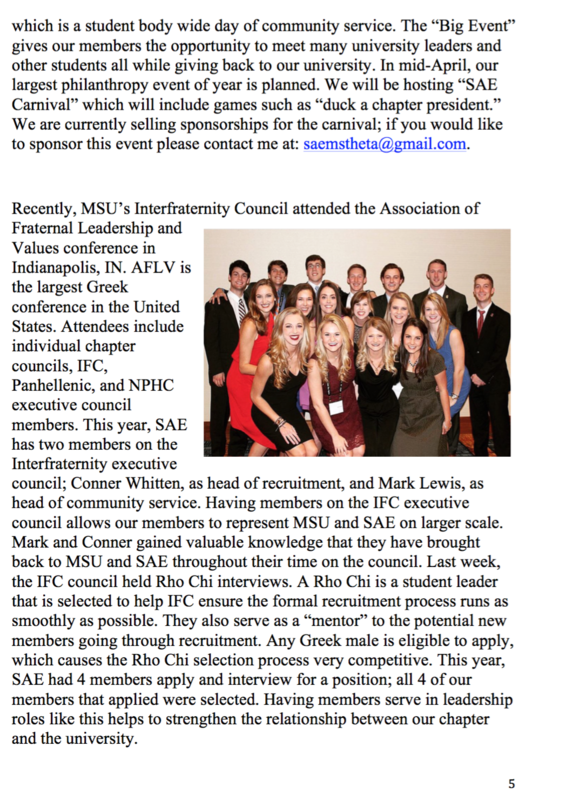 fraternity or sorority. 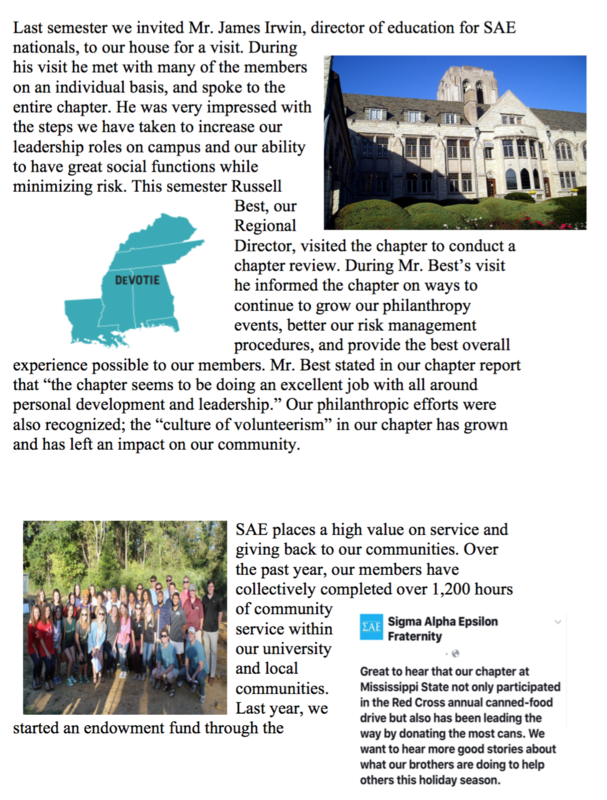 In addition to community service, our chapter GPA of 2.9 ties us for sixth out of 20 fraternities, second among fraternities larger than 100 members. As another year comes to a close, we would like to thank all of you for your support. 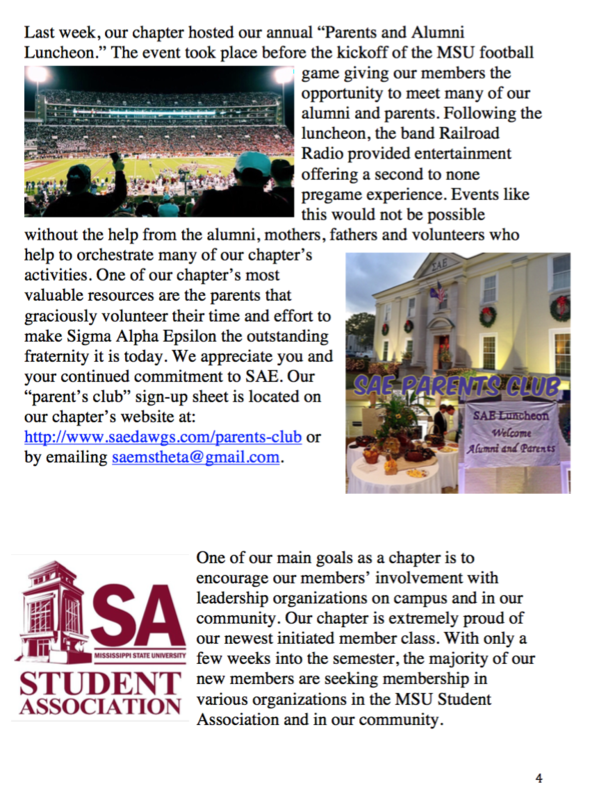 Our chapter could not be where it is today without the contributions of everyone that came before us and especially without the continued support of our alumni chapter. We look forward to picking up where we left off next fall, and we invite you to come visit and see the house when you are in town next football season. We hope you have a happy and safe summer.